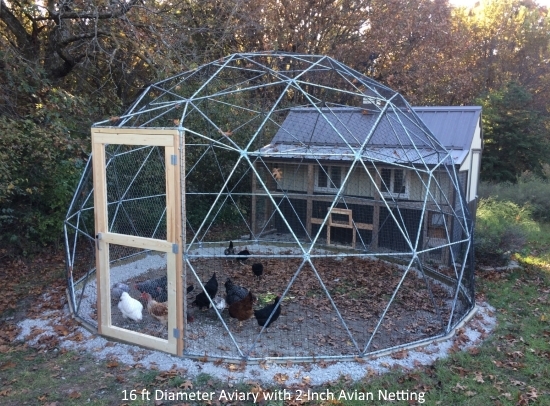 At last, an aviary that is large, beautiful, and affordable! Suitable for birds and other animals that do not bite and chew such as chickens, ducks, geese, pheasants, quail, etc. Avian netting is made from black, heavy, knotted, UV stabilized, polyethylene plastic cord. 2 Inch square hole size is standard and you may upgrade to 1 inch hole size. Wrap wire mesh around just the bottom row to protect from predators. For birds and other animals that can bite and chew, a wire mesh covering is a great solution. Several wire mesh options are available to choose from. The most popular are 1/2 inch 19 gauge and 1 inch 16 gauge. Please let us know what you need. 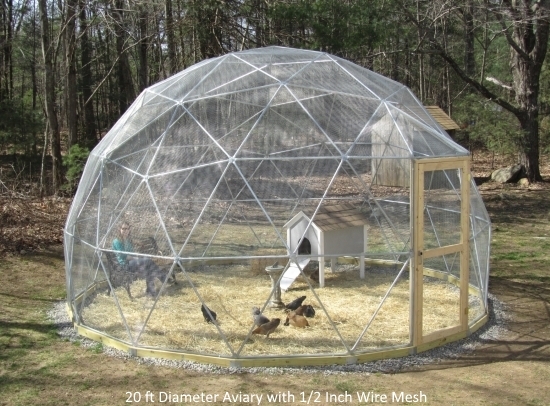 For birds that are sensitive to galvanized coatings, stainless steel wire mesh and hardware are available as well as powder coat painting for the dome frame. Several wire mesh options are available. Please contact us for information and pricing. 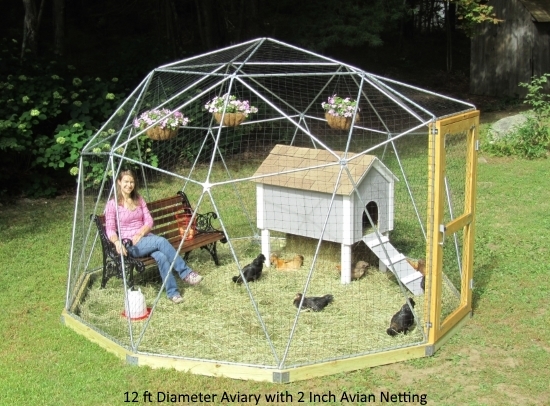 Avian netting aviary kits include: a geodesic dome frame, 2 inch avian netting (you may upgrade to 1 inch avian netting), a door kit or Andersen glass storm door (20 ft kits and larger only), all required hardware, step-by-step illustrated assembly instructions, free plans to build a wooden 4x4 foundation ring, and free shipping anywhere within the U.S. contiguous lower 48 states. 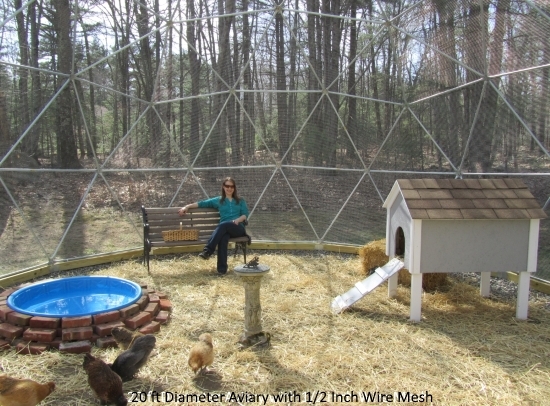 Wire mesh aviary kits include: a geodesic dome frame, 2 inch avian netting (you may upgrade to 1 inch avian netting), a door kit or Andersen glass storm door (20 ft kits and larger only), all required hardware, step-by-step illustrated assembly instructions, and free plans to build a wooden 4x4 foundation ring.